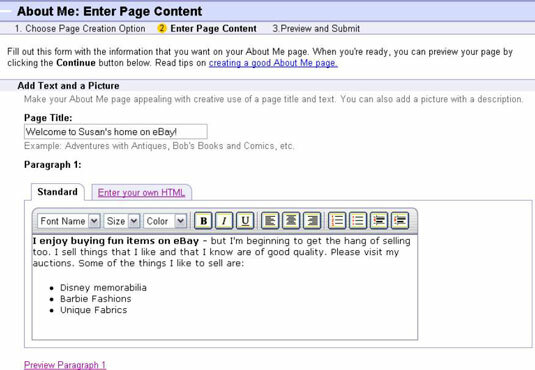 To create your eBay About Me page, click the Me icon next to any user’s name, scroll to the bottom of the About Me page that appears, find the line that reads “Create or edit my About Me page,” and click. You can also click the About Me link on the my eBay Account tab→Personal (or Business, depending on your account) Information. Then follow the simple formatted template for your first page and work from there. Who you are and in which city you live. Your hobbies. If you collect things, here’s where to let the world know. Whether you run your eBay business full-time or part-time, and whether you have another career. This is more integral information about you; let the world know. The type of merchandise that your business revolves around. Promote it here; tell the reader why your merchandise and service are the best! Your most recent feedback and a list of your current auctions. 1Click the Site Map link at the bottom of the eBay home page (under Tools). 2In the Connect area, click the About Me link. If you haven’t signed in, type your user ID and password in the appropriate boxes. You’re taken to the About Me page. 3Click the Click Here button. Decide whether you want to use eBay’s easy step-by-step process or enter your own HTML code, and then click Continue. Because entering HTML code assumes you really know what you’re doing, it might be a good idea to choose the step-by-step process. Page title: Type the title of your About Me page (for example, Welcome to Larry Lunch’s Lunchbox Place). Welcome paragraph: Type a personal, attention-grabbing bit of text that greets your visitors. You have the option of typing in your own HTML coding or using the buttons at the top of the box to change the font, color, size, and attributes. The HTML generator is similar to the Sell Your Item page — and similar to most word-processing programs. You can preview your paragraph at any time by clicking Preview Paragraph at the bottom of the text-entry area. If you don’t like what you see, close the Preview window and continue to edit your masterpiece. Another paragraph: Type text for the second paragraph of the page, such as Vintage, Modern, Ancient. Then maybe talk about yourself or your collection. Picture URL: Type the website address (URL) where people can find your picture. Feedback: Select how many of your feedback postings you want to appear on your About Me page. Items for Sale: Select how many of your current listings you want to appear on your About Me page. If you don’t have any auctions or Buy It Now items at the moment, you can select the Show No Items option. Favorite Links: Type the names and URLs of any web links you want visitors to see, for example, a website that appraises lunchboxes. 5After you’ve finished entering this information (and are happy with how it looks), click Continue at the bottom of the page. Don’t worry if you’re not absolutely wild about your page on the first pass. The important part is to get it published. You can go back and make changes as often as you want. 6On the About Me Preview and Submit page, click the button that corresponds to the layout option you want. You’re presented with three layout options. 7Scroll down the page and check out what your About Me page will look like. If you don’t like your current layout, go back up the page and change the layout. If you don’t like what you see, click the Back button and do some more editing. 8When you’re happy with your masterpiece, click the Submit button. You did it. Now anyone in the world with access to the Internet can find your personal About Me page on eBay. Don’t forget to update your About Me page often. A good About Me page makes bidders eager to know more about your auctions. An out-of-date About Me page turns off potential bidders. If you choose to update your page, you need to edit it using HTML. If you don’t use HTML, you have to create an entire new page.